State and federal governments pay for well over half of Kansas hospital care and regulate 100 percent of our activities. Those are the main reasons why the work of the Kansas Hospital Association and its political action committee, KHA-PAC, is so important. Elected individuals who have a passion and understanding for the unique role hospitals play in their communities are critical. Your individual contributions to the KHA-PAC are used to support those who champion our issues. Please commit to helping us achieve the best possible political outcomes. For more information on KHA-PAC, contact Cindy Samuelson or Chad Austin at (785) 233-7436. Hospital Contributions and Goals as of November 14, 2018. Contributing to the KHA-PAC is Easy! 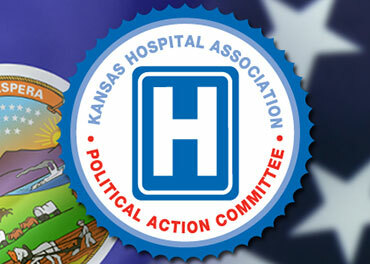 Through your investment in the KHA-PAC, the voice of the hospital community can be heard in Topeka and Washington. Your contribution will ensure that the hospital message will not be overlooked by candidates for state and federal office. Your contribution will be used to support those candidates who support our mission of delivering quality care to our patients. Contributions can be made online. Your contribution is important to us, but we want to emphasize that all contributions are voluntary and have no impact on your job status, performance review, compensation or employment. Any amount given or the decision not to give will not advantage or disadvantage you. Contributions or gifts to the KHA-PAC are not deductible as charitable contributions for federal income tax purposes. A portion of your contribution can be shared with the AHAPAC if you so designate. Downloads for information specific to the KHA-PAC.